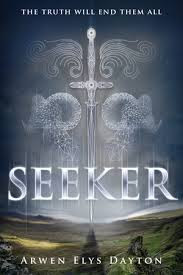 Seeker by Arwen Elys Dayton hit the number 6 spot in the Teen section of the Barnes and Noble Nook store on March 21st. The following week, it rose to number 4. Arwen joins us today to talk about her young adult bestseller and its e-pub success. Let's start with finding out what your book is about. Seeker is a heroic family tale gone terribly wrong. It's set in the near future, in Scotland and Hong Kong and is the story of teenagers who've been raised on an isolated estate, where they've been put through years of brutal training. They've been taught to fight, mastered unusual weapons and gradually learned secret knowledge, all of which will be used for a noble purpose. But the adults in their lives, including their own parents, have been lying to them. Now that their training is over, instead of noble acts, they are forced to do terrible things. Danger confronts them from all sides as they make a desperate attempt to get away, discover who's a friend and who's an enemy, and try to choose a path for the future. My own children read both e-books and paper books, and often will have both versions of the same book. They love paper books because they are lovely objects to own and put on a shelf, but they also love e-books for the convenience of reading on the school bus, on a trip, etc. I doubt comprehension has anything to do with the format of the book. If anything, it's easier to look up words when using an e-book because the dictionary is incorporated into the device. But comprehension has more to do with a particular child's study skills, in my opinion, not how the book is delivered. I treat writing just like any other job and set aside a big chunk of every weekday for writing. Of course, I also have to fit in the other parts of the writing job, such as interviews (like this one! ), research, and book events, so sometimes there's a bit of juggling in the schedule. Right now I'm working on Traveler, which is book 2 of the Seeker series. I've finished the first draft! It's been quite exciting to follow the characters around the world as the story continues. Time to pull out your Magic 8 Ball: How do you see the world of e-publishing developing for children and young adults over the next 5 years? I predict e-books will continue to grow in popularity. However, I've noticed readers (especially children) enjoying the print versions of books, particularly nicely made hardbacks, so I imagine readers will more and more often have both the e-book and paper version of titles. Who knows, eventually both versions may come bundled together, so when you buy a book, you are buying it in two formats, or even three (with audio). Do you think it will ever exceed or replace print publishing? E-books will exceed print publishing in numbers for sure, because with the e-format, millions of titles can be kept "in print," and there is instant gratification – if you hear about a book you can own in immediately. But I don't think e-books will replace print. They will live happily alongside each other. It absolutely helps me, because it keeps my books available forever, and it opens up new audiences for my stories. Learn more about Arwen and her books by visiting her website, or by following her on Facebook, Twitter or Instagram. See the latest Kids' EBook Bestseller List for more top ten e-format authors and their books. It's updated every Saturday morning. Check back next week when my featured author will be Alison Weir.